Abby the Librarian: ALA: Here's Where I'll Be! 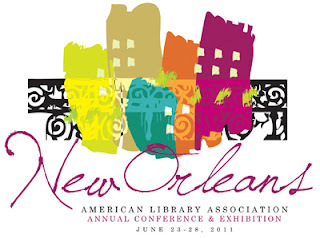 I can't tell you how excited I am to party hard learn and grow with my fellow librarians this weekend at the ALA Annual Conference in New Orleans! Will you be at ALA? I would love to get together! Friday, June 24 from 3:00pm-4:00pm in Convention Center Room 271-273 - The Emerging Leaders Poster Session! Come see my group's presentation and learn all about how you can make your videogame collection the best it can be! Friday, June 24/Saturday, June 25 during the wee hours at OZ New Orleans (800 Bourbon Street) - ALA Dance Party!!! Saturday, June 25 from 8:00-11:00pm at Tommy's Wine Bar (746 Tchoupitoulas Street) - The Great YA Blogger Meetup! Sunday, June 26 from 1:30pm-3:30pm in Convention Center Room 255-257 - Best Fiction for Young Adults Teen Feedback Session. (It will always be BBYA to me...) This was one of my favorite things at the Midwinter Conference. These teens speak so eloquently about the books they love (and hate!). Sunday, June 26 from 4:00pm-5:30pm at Marriott at the Convention Center - Teen Services Mashup. Our own Kelly of Stacked and Sarah of YA Librarian Tales are presenting during this table talk session! Sunday, June 26 from 6:00pm-10:00pm at the Marriott New Orleans - Newbery/Cadecott/Wilder Banquet. I did not splurge for a banquet ticket, but I might try to grab a seat in the back to hear the speeches. Monday, June 27 from 8:00pm-10:00pm at the Hilton Riverside - Printz Reception. I did splurge for a ticket to this one. So, if you're going to ALA, look for me in those places. I will be tweeting the conference (follow abbylibrarian) while I'm there! If you want to meet up, tweet me or shoot me an email at abbylibrarian@gmail.com. I tried and failed to meet up with some awesome people at Midwinter, so I know how busy and overwhelming it can be, but I promise I'm going to try to do better this time!